A heavy snowfall has hit Santiago de Chile causing disruption and blackouts, leaving thousands of residents shivering in the dark. According to officials, about 250,000 people were affected by power cuts, mostly caused by snow-laden trees falling on cables. One death was reported – of a worker trying to clear ice – and two other people were injured by a fallen power line, Chilean media said. 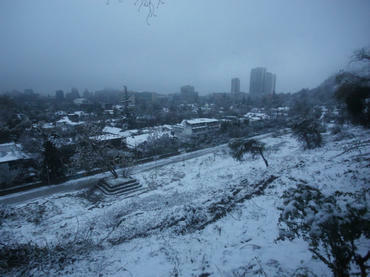 According to meteorologists, it was the heaviest snowfall in the Chilean capital since 2007. The snowfall came as Santiago and surrounding region were enduring an unusually cold snap. As well as the power cuts, the weather has caused traffic disruption in the city and several sporting fixtures have been postponed.